Do Technology Classes Count for Continuing Education Credits? Given how important the Internet and technology are to so many teachers today, many people find themselves wondering whether or not they can use technology classes for continuing education programs required by their employer. It’s hard to provide a universal answer to this question since each individual employer will enforce different guidelines. Generally speaking, however, these classes can almost always be used to satisfy continuing education requirements. There are a few tricks, however, that should be used as a way to virtually guarantee that these classes will fulfill professional requirements. The most important aspect of any continuing education class is that it enhances an teacher’s understanding of their position and allows them to perform better on the job. For this reason, teachers who are taking technology classes should make sure that the class focuses on a relevant part of their job. 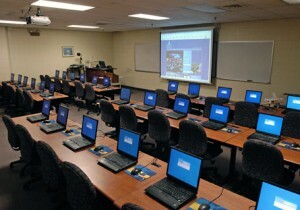 A teacher would want to take a class in instructional technology in order to satisfy a continuing education requirements. A course in legal technology, however, would not satisfy a teacher’s continuing education requirement as these courses are typically recommended only for legal professionals. Some employers will want to know what an employee’s rationale is for taking a given class to satisfy their continuing education requirements. The best way to answer these concerns is simply to show or demonstrate how the topics covered would be of use in the workplace. A teacher might want to discuss how their understanding of social media might help interact and connect with high school students. They may also make a case for learning publication software in order to teach a journalism class. Whatever the subject, make sure that the lessons learned in technology courses have practical applications as well as theoretical benefits. Sometimes, one class in technology can inspire someone to pursue several classes on the same subject. If this is the case, why not turn this into a graduate-level degree in the tech field? Better yet, the degree program itself will act as a justification for taking further classes in this subject area and may even satisfy continuing education requirements for several years at a time. Employers are looking primarily for continuing development among their employers. Turning a course into a degree is one way to prove that the class is useful, relevant, practical, and bound to benefit the broader organization. Finally, remember that continuing education is primarily about skill development, not skill review. Take an advanced class that is challenging as well as relevant. Make sure that it covers new topics, rather than reviewing old and basic technology concepts. Employers and professional organizations review each employer’s continuing education class selections. They’ll be less likely to strike a class that taught new concepts. Use continuing education requirements as an excuse to broaden horizons, learn new skills relevant to the workplace, and enrich understanding of other industries. Taking technology classes for continuing education requirements can certainly satisfy the objectives of continuing education while enriching the student and providing them a new base for future workplace opportunities. Related Resource: What are the Basic Classes Required for an Education Major?